Originally from Chicago, Linda Mitchell grew up in a musical family who sang together round the kitchen table. She and her sister made light of chores, singing in harmony while doing the dishes.Growing up listening to her father playing jazz standards and the American Songbook on his guitar lit the torch of her desire to be a musician. She also listened to the music of her generation including early country standards, rock and roll, blues, folk and modern jazz. Today with a career spanning nearly four decades, she’s an accomplished, professional Jazz/Blues musician who also dabbles in Classic Country. Her stable and steady approach to blues and jazz guitar are the perfect undercurrent for her emotionally generous, distinctive, rich and inviting voice. Dame Mitchell is one of those premiere vocalists, who will soothe you one moment and bring you to your knees the next. 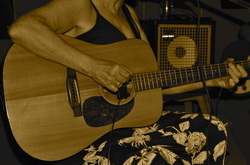 An established member of the local music scene, Linda has been singing and swinging the Southeast and Western North Carolina for over 10 years. From festivals, night clubs, dinner clubs and listening rooms to hotel bars, house concerts, fundraisers, benefits and special events, this lady satisfies a cross section and range of audiences. Area venues where she regularly fills and fulfills include The Grey Eagle Music Hall, Isis Restaurant and Music Hall, White Horse Black Mountain, The Phoenix in Brevard, South Creek Winery and Burnt Shirt Vineyards, Tressa’s Downtown Jazz & Blues, Jack of the Wood, the Lobster Trap and the Root Bar #1. Not only does she write evocative, poetry set over Jazz progressions with flowing melody lines, she interprets and improvises covers of standards and blues with butter-spreadin' ease. Versatile, and skilled at knowing the pleasure center of any crowd, she performs solo to quartet. Stage partners can include flutist, violinist/fiddler, upright or electric bassist, guitarist, drummer, keyboard player/pianist and backing vocalists. Whether playing solo or in the company of other musicians, she is a sought after performer who is a welcome addition to any venue. Please leave a comment and submit by clicking below.